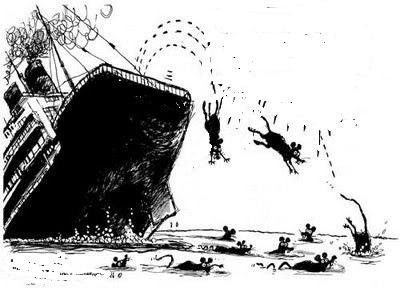 Not only are the Alberta Tory rodents scampering towards the nearest deck, today a couple of them even jumped over the side of the ship. Fish Creek MLA Heather Forsyth and Airdrie-Chestemere MLA Rob Anderson announced that they had finally given up on Special Ed and had become proud new members of the Wild Rose-Alliance caucus. With the defectors joining Calgary Glenmore MLA Paul Hinman, the new party now has three members in the legislature. For Ed and the tired and bedraggled Tories the chickens are coming home to roost big time. Forsyth was one of the Calgary ministers Ed purged upon his takeover of the party. She had been both Solicitor General and Minister of Children’s Services in a high profile political career that began with her first electoral victory in 1993. The protection of children was a major interest for her and even Reader’s Digest recognized her contribution in the area by naming her a Canadian Hero in 2002. But it didn’t matter to Ed and the boys. Calgary had taken enough from the cookie jar. It was the yokels' turn. Forsyth must have smarted from her fall from being a prominent and senior minister to being relegated to the chair of the moribund Alberta Heritage Savings Trust Fund, and positions on such lowly committees as Private Bills, Privileges and Elections, and Orders and Printing. How much lower can you get? Anderson is a new kid on the block having been elected in the spring election of 2007. He is reported to be a very bright guy who worked as one of the suits for the same downtown Calgary blue-chip law firm that pays Ralph Klein a tidy sum to tell dinosaur fart jokes while yukking it up over scotch with their clients in oak-paneled board rooms. Anderson’s statement accused Stelmach and his pals of failing to address his constituents’ concerns and of muzzling him in speaking out about the issues. Thus, he said, he was going to speak more forcefully for the people who elected him and added, “I have no interest in investing any more of my life and taxpayer’s money defending poor public policy that has been developed by a small band of out-of-touch government appointees and insiders.” I presume he was talking about Special Ed and his band of yokels. They are the first of what is likely to be a steady procession of Alberta Tories abandoning what was once the proud party of Peter Lougheed for more promising prospects. Conservatives, after all, have proven more than once that they believe that “if the guy that brung ya falters on the dance floor, well then, we’re outta here,” such as when Socreds bolted from the party of Harry Strom to the party of Peter Lougheed. The best recent example was the fate of the federal Progressive Conservative Party in the wake of the unpopularity of Brian Mulroney and the ineptitude of his successor Kim Campbell. In the West, PCs switched and voted en masse for Preston Manning and his Reform Party and the old federal PCs were kaput. The Alberta PCs blew their only chance of survival by not having the courage to dump Stelmach at the leadership review convention in November. Now they are stuck with him until the next election. Is there a chance of Eddie leaving before then in favour of a new and more attractive leader? I don’t think so. There is no messiah on the horizon. And besides, he and his yokels still have the cookie jar, which was what it was all about in the first place.